First, Charles Dana Gibson brought us the Gibson Girl. 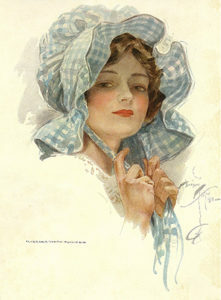 Then, after Gibson’s retirement from illustrating, Harrison Fisher arrived on the scene. His Fisher Girl “redefined the American ideal of feminine beauty” (Harrison Fisher and the American Beauty) during the first quarter of the 20th century. Harrison Fisher was born to be an artist. His father, Hugo Antoine Fisher, was an artist as was his paternal grandfather, Felix Xavier Fisher. Felix, his wife Mary, and Hugo and his wife Addie, immigrated from Prague, Bohemia, Austria (now part of the Czech Republic) sometime during the early 1870s. They settled as one household in Brooklyn, New York. The 1880 federal census shows that the family also consisted of two sons, Harrison, and Hugo. Harrison was born on July 27, 1877. Both boys would grow up to be successful artists. Hugo Melville Fisher was known for his Pacific coastal landscapes and Parisian street scenes. The family moved to Alameda, California in 1887. This allowed Harrison to receive formal training during his teens at the Mark Hopkins Institute of Art in San Francisco. His goal was to be an illustrator and commercial artist. One of his classes was instructed by Amadee Joullin who was known for paintings of the Aztec people. Harrison submitted one of his drawings to the United States Playing Card Company in 1894. They liked it enough to publish it on the back of decks of playing cards. The same year, one of his political cartoons appeared on the back cover of Judge, a humor magazine. At age 17, he was hired by the Morning Call (later known as the San Francisco Call). He moved to the San Francisco Examiner where his talent was recognized by the publisher, William Randolph Hearst. It wasn’t long before Harrison Fisher was back in New York working for a new Hearst acquisition, the New York Journal. Harrison wouldn’t spend too much time at the Journal before moving on to work for one of the nation’s first humor magazines, Puck. 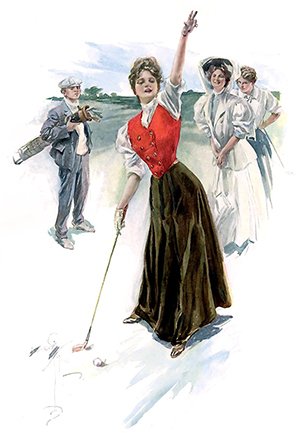 In 1898, his work started appearing on the covers of such notable publications as The Saturday Evening Post (1898), The Woman’s Home Companion (1901), and The Ladies’ Home Journal (1903). Doors were opening and in 1906 he was hired as an illustrator for The American Magazine, a Hearst publication that was a Sunday newspaper supplement. 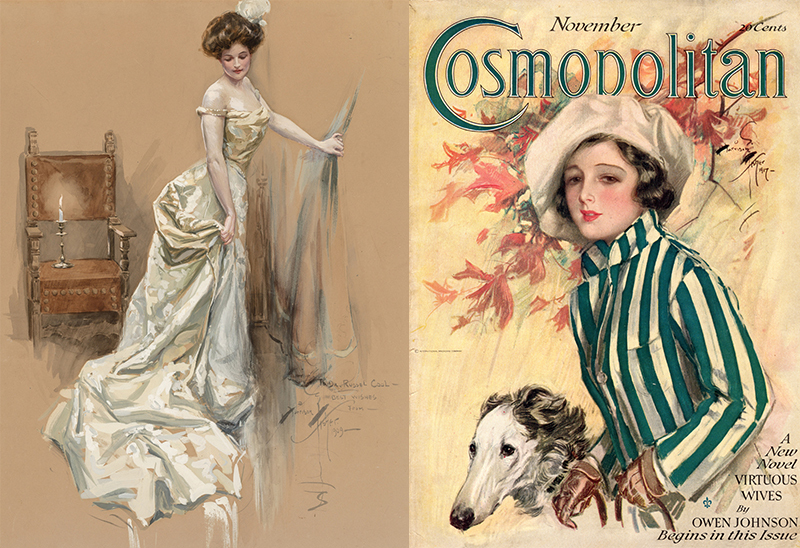 This lead to covers for Colliers (1907), and Cosmopolitan (1907). He was now a household name. With his distinct illustrations becoming more popular, Harrison signed an agreement with Charles Scribner & Sons in 1907. 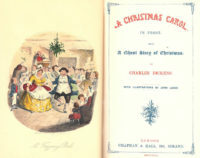 The publisher created a large coffee table edition of glossy bookplates that showcased his illustrations’ ethereal style and the artist’s immense talent. This was the first of fifteen books that featured his artwork paired with specially selected poetry. Harrison Fisher also provided original illustrations and cover art for novels of the day. His work appeared on the covers of books by Percy Brebner, George Barr McCutcheon, Harold MacGrath, and Katherine Thurston. Other freelance work included illustrations for Armour’s beef and Pond’s soap. 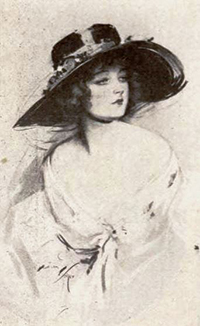 In addition to illustrations, Harrison painted portraits of many celebrities of the day including the actress Marion Davies (and Hearst’s mistress), F. Scott Fitzgerald and his wife Zelda, and Billie Burke (Glinda, the Good Witch of the North in The Wizard of Oz). He answered the call for the cause during World War I. Four of his illustrations were used on posters that publicized the United States’ war effort. They appeared on buses and in windows. 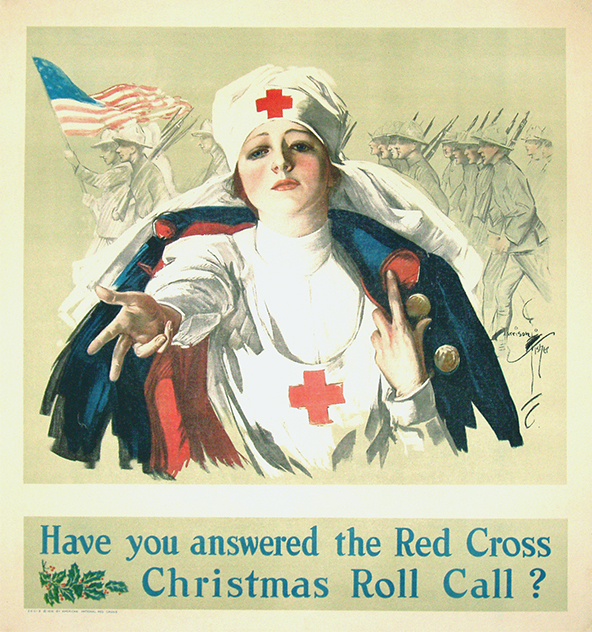 Three posters were made for the Red Cross. The jawline is a steeper angle than found in the human anatomy. Other characteristics include wide-spaced eyes and short noses. 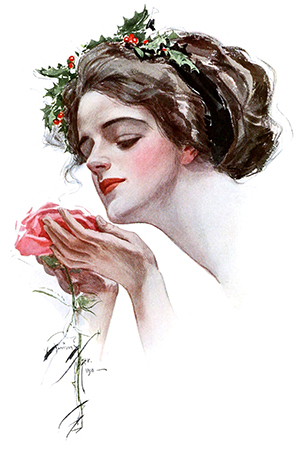 “His illustrations are a kinder, softer representation of substance.” (Harrison Fisher and the American Beauty). He was a master of watercolor and used this medium to his advantage to create this illusion. The man who was surrounded by beautiful women claimed he was too busy to marry. He was a bachelor when he died on January 19, 1934. His estate of more than $250,000 was left to his companion and secretary, Kate Clements. George M. Cohan delivered the eulogy at his funeral. Harrison Fisher never valued his illustrations because they were commercially available. 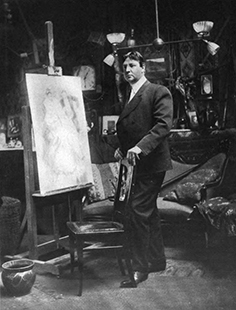 “After his death, a relative kept a few paintings and burned over 900 of his remaining artworks, at his request.” (Harrison Fisher, American (1877 – 1934). His remaining artwork can be seen in many museums throughout the United States. He was inducted into the Society of Illustrators Hall of Fame in 1997.